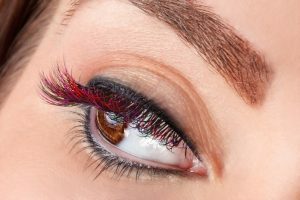 To avoid the constant visit to the salon to have your lash extensions refilled, then removed and applied again, you can opt to have permanent eyelash applied in place of your weak natural lashes. Unlike semi-permanent lashes which are composed of synthetic fibers which are glued to your natural lashes, permanent lash extensions are grafted or transplanted. The existing lashes are removed and in their place, new lashes are put in their place and they will remain there for as long as you live. The permanent lashes will only require trimming every once in a while and they will not fall off like the natural lashes. This will make the maintenance of the permanent eyelash extensions quite affordable. The grafting of permanent eyelash extensions will require a highly skilled person who is licensed to carry out such a sensitive process. The specialist will remove some hair from a part of your body, usually at the back of your head and transplant them one by one onto your eyelids. He will repeat this procedure until the desired thickness is achieved. Though it is a complicated process, it does not take long to have them fixed especially if the person applying them is experienced. They will not need replacement or refilling like the semi-permanent lashes will. This makes them cheaper to maintain as once you pay the initial cost, you will only require trimming once in a while. They do not need to use glue to apply them as they are grafted; due to this those who suffer from allergic reactions as a result of the glue will have nothing to worry about. Permanent lashes will not be damaged by tears or water after application, unlike semi-permanent lashes where you have to prevent eyes from wetting the lashes when taking a shower or even avoid crying. Application of permanent eyelash extensions is quite expensive with the price ranging from $5000. For the semi-permanent lashes, you only have to pay a small amount of money and you will have them fixed. The application of permanent lash extensions will consume more time than the application of the semi-permanent lash extensions. As a result, you cannot apply them on a short notice but have to book an appointment so that the specialist can get everything ready for the tedious process. The permanent eyelash extension cannot be changed easily like the semi-permanent lash extensions which you can easily remove if you do not like the way you look. You will be stuck with that look for a long time. Before getting the permanent lash extensions done, you have to be sure that this is what you really want. You will be stuck with that look for long and the procedure is too expensive to be repeated every other time. The grafting costs thousands of dollars and you, therefore, have to look for a person who is an expert in the field so that you get value for your money.